Now that everything is Christmas around here we are starting our list of Christmas themed art's and craft's to do with the kids. We will be doing Two activities in one post every Monday. We have lots of fun activities planned and have been enjoying making these two for you. 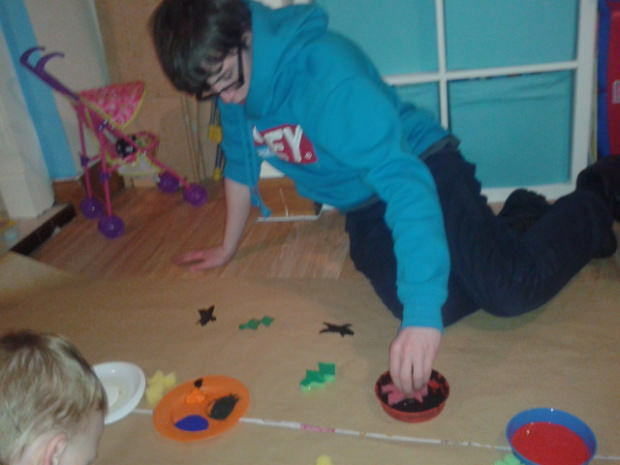 This week we are making some homemade wrapping paper and hand-print wreaths. 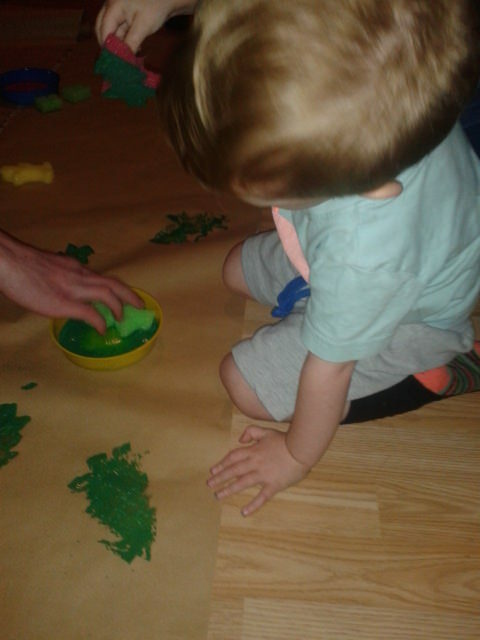 Both activities are pretty easy to do and are perfect for toddlers and older children alike. Now that you have everything you need you first need to make lots and lots of green hand-prints. 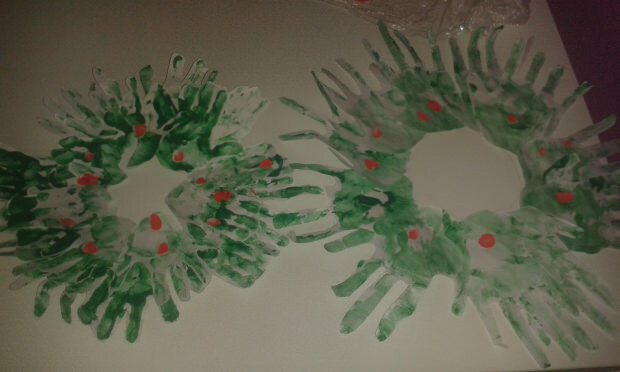 D really enjoyed making them as he got to get paint all over his hands and splat it onto the paper! Uncle L not so much. 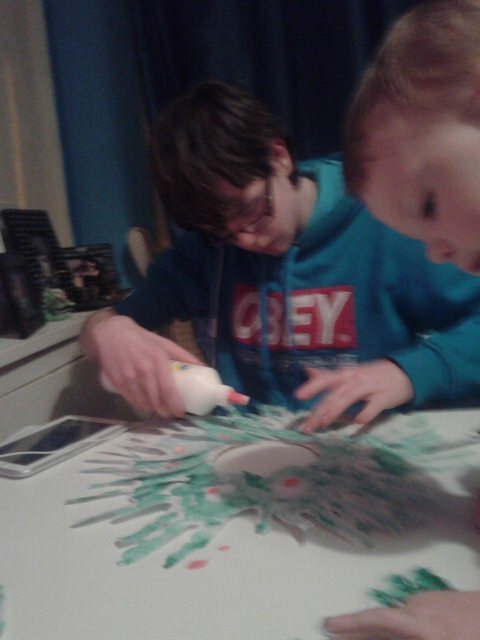 He hated the feel of the paint and spent the whole activity complaining about the feeling of paint. I thought everyone loved hand-print / finger painting! You also need to make a few red finger prints which will be berries on the wreath. Once you have finished with your painting you will need to let them all dry. Ours were left overnight to dry. 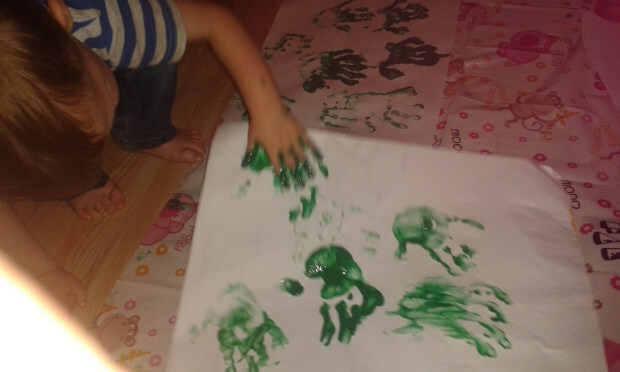 Every surface in the house was covered in green hand-prints! The next step to complete once the hand-prints are dry is to cut them all out in their hand-print shapes. They don't need to look perfect, I like the fact the D's and Uncle L's have some white showing through as it shows we made them and nothing is perfect, right? Don't forget to cut out your berries too. 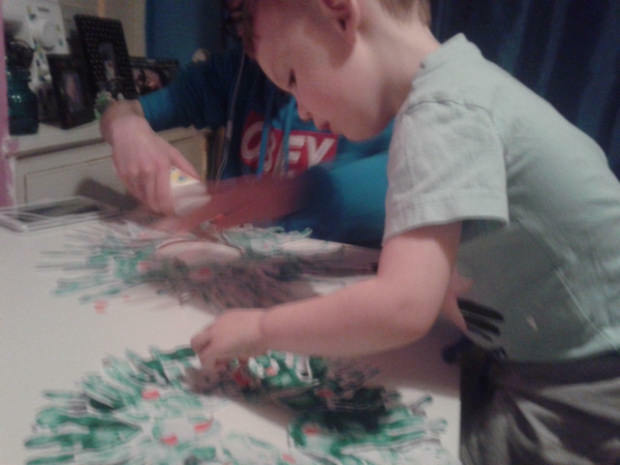 D really enjoyed getting to cutting, although he did only cut one hand-print into tiny pieces! He did enjoy trying. Take your ring of card and start gluing your hand-prints down. D had to make his hand-prints go around in two layers whereas Uncle L only made his go around in one layer due to their hand size. 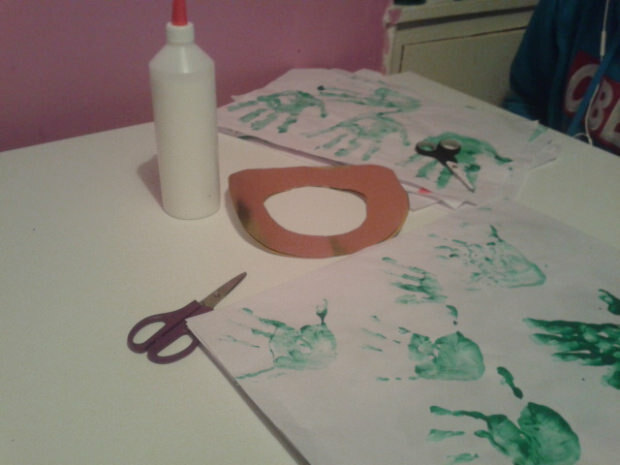 Once you have all of your hand / finger prints stuck down you just need to let them dry before you hang them up! 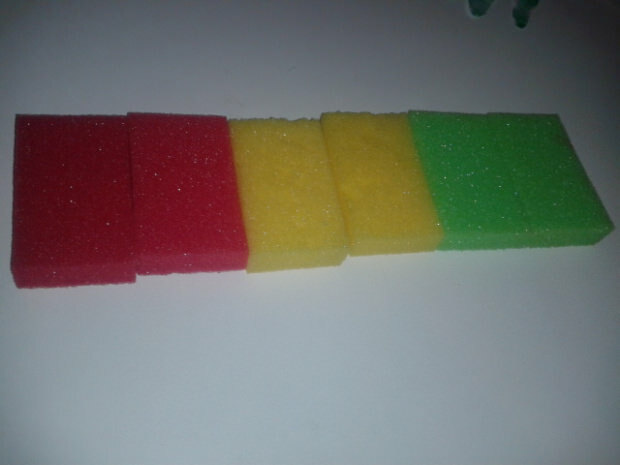 First you need to make your sponges into shapes. 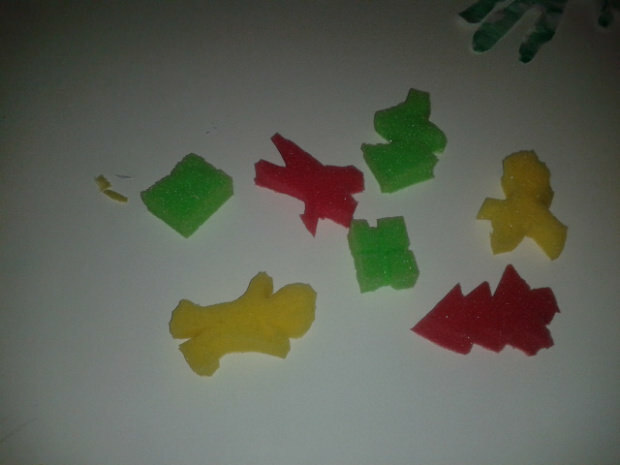 Myself and Uncle L did this part as sponges are kind of hard to cut especially in circles! We used normal sponges you use to clean dishes etc. I had cut the top off and then cut to shape. Now get stamping those sponges to make the shapes on your paper. Uncle L much preferred this activity as he didn't have to put his hand inside the paint. D loved this one too. 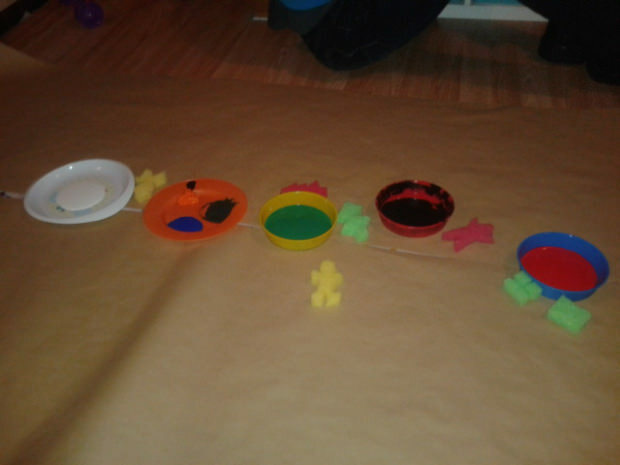 There's nothing like some paint and sponges to make a 2 year old happy! Allow them to dry if you run out of space to have the paper unrolled you can let it dry before you move on to the next part of the paper. It is easier if you start to roll up the other side when doing sections.Once you have the whole roll complete by doing sections you can start to wrap things with it! The wrapping paper would be a good daily project to do with your child everyday a bit like a crafting advent calendar but you don't know when it will end! 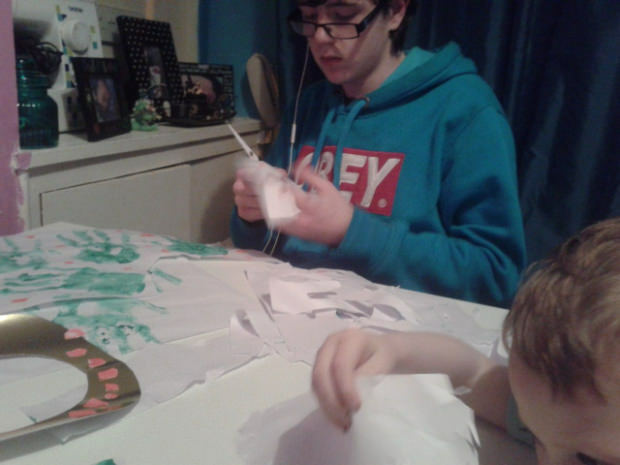 We all really enjoyed doing both of these art's and craft's projects. I think that we will have lots of lovely wrapped up presents under the tree soon. 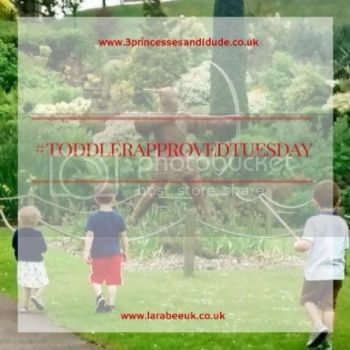 Thanks for sharing some great toddler crafts with us on #ToddlerApprovedTuesday! 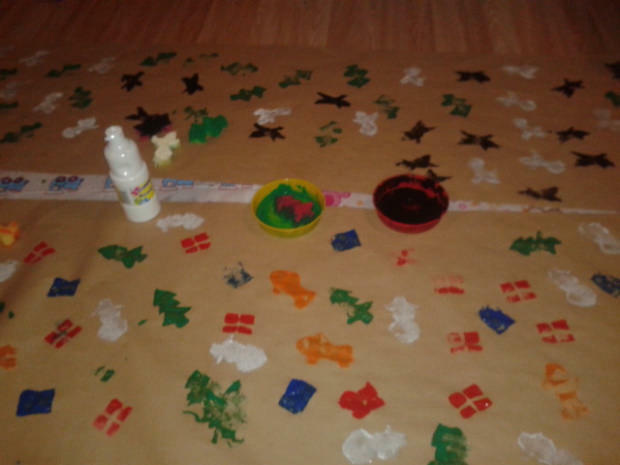 We made gift wrap last year using Christmas cookie cutters, it worked great and the grandparents loved it! We all enjoyed making it and I know a lot of our family will carefully unwrap it and keep the wrapping paper as they made it themselves!